I am so loving this year’s Vegan MoFo experience — Ashley and I have had a couple of fun dates in the kitchen already, and we’re constantly throwing delicious ideas back and forth over text messages. This morning’s breakfast is from Ash, and I can’t wait to make this chocolatey goodness for myself. Enjoy in good health! When I first started dating my partner Corbin, making gluten-free and vegan food was something totally new for him. I remember him being a bit intimidated by the list of things I didn’t eat and sources of sneaky gluten and dairy, but he was willing to learn and has now cooked for me more than anyone else in my life!! He is a breakfast CHAMPION and this was one of the first recipes he often had on hand to feed me in the morning. It’s delicious, easy and combines ingredients you likely have on hand! You can also tailor it to what’s in season or what kind of flavor you’re feeling, making it pretty versatile. Feel free to adjust the amount of cacao, cinnamon, milk and sweetener to suit your tastes. We often top it with raspberries as Corbin is blessed with a huge raspberry bush in his backyard (which Linz is rather envious of!) 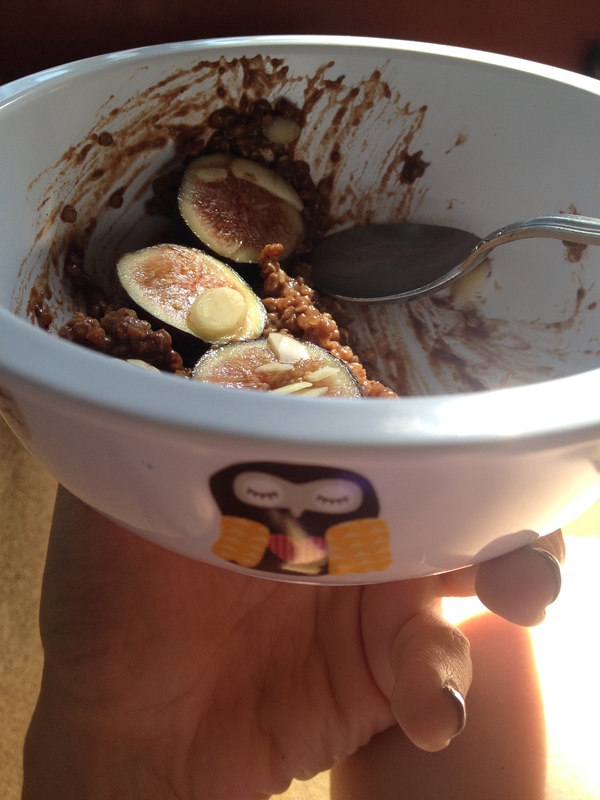 In this case, chocolate + figs + protein = a HUGE winner! My super special owl bowl makes an appearance in these photos. I bought it with Linz on one of our hilarious trips to Target to cure grouchy moods or crummy weather. Buying a $2 bowl in the children’s department of Target is destined to put a smile on your face. I promise. Inspired by “Chocolate Banana Breakfast Quinoa with Walnuts” from seeds’n’smiles; Makes 2 medium servings or 1 large serving. Add quinoa, non-dairy milk, water and cacao to a small saucepan and bring to a boil. Once boiling, turn down to a simmer until quinoa is cooked. At this point you can add additional milk to reach your preferred consistency. Remove from heat. Add the banana and cinnamon and mash with a fork until well combined. The banana adds sweetness, but you can add some sweetener to suit your palate. 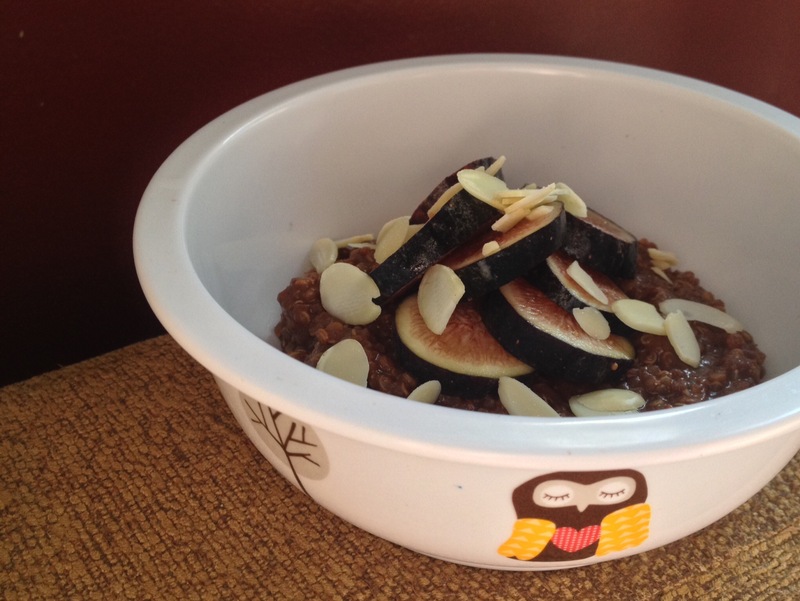 Pour porridge into a bowl and top with sliced figs and almonds. If reheating, add some additional water or milk as it tends to dry out a bit once refrigerated. I would eat this porridge right away without knowing it’s gf! 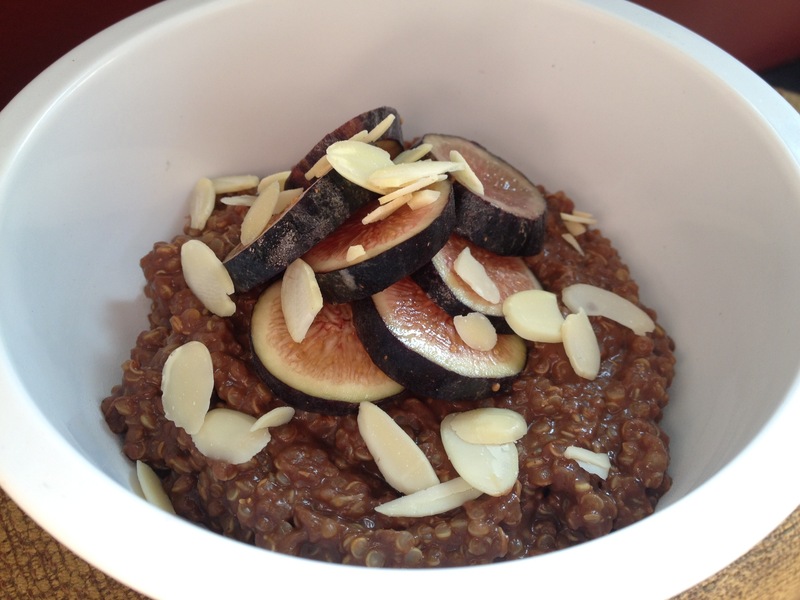 I haven’t made sweet ‘quinoa’ porridge before, but I think I want to make some! Cute bowl btw!